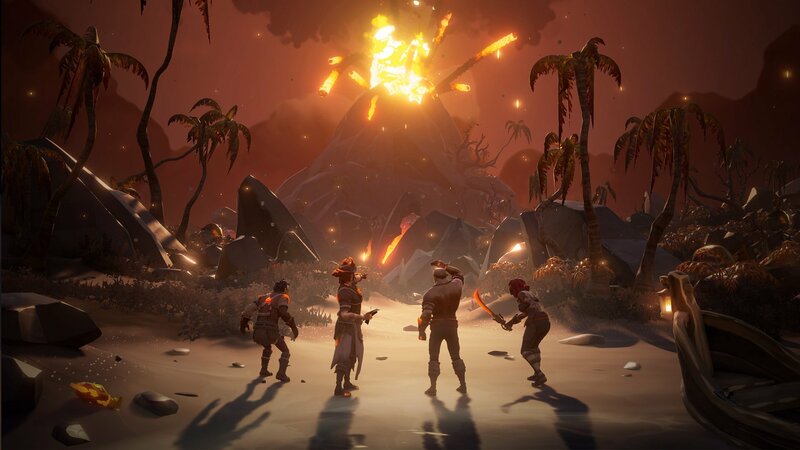 Sea of Thieves version 1.3.0, the official release of Forsaken Shores, is one of the largest updates since the Cursed Sails event back in July, as it brings with it not just a few changes to the world, but an entirely new area of the map for players to explore. The Devil’s Roar is an extremely hostile location, full of erupting volcanoes, tremors, geysers, and boiling water. Anyone who owns a copy of Sea of Thieves, regardless of platform, will be able to download the Forsaken Shores content update for free. Forsaken Shores also introduces a few new tools and mechanics for players to contend with, the most notable being the rowboat. Players can find these marooned on beaches and can be pushed out to sea and attached to ships. There are also a host of Bilge Rat commendations and doubloons to earn, which can be used to purchase time-limited cosmetic items. Be sure to check out our guide on how to update Sea of Thieves on PC if you’re having trouble getting Windows 10 to cooperate as well as our Sea of Thieves Guide and Walkthrough for a comprehensive collection of pirate articles! Devil's Roar Map - Explore the newly emerged lands to the east, where both sea and land provide new hazards for unwary pirates! Volcanoes - Exploding in a fiery inferno, volcanoes rain down hot rocks that damage players and ships. It has never been more important to think carefully about where you anchor! Geysers - Geysers are active in The Forsaken Shores and can launch the player into the air... so watch where you step! Lava Floor - Lava floor zones become active during a volcanic eruption and will cause damage over time if you stand on them. Keep moving! Superheated Water - During a volcanic eruption, the waters around the island become superheated. Damage is not applied to ships, but pirates who opt to stand or swim in the superheated water will find themselves in dire need of a banana. Water in your hull can also become superheated, so have your bucket at the ready! Rowboats - Find these new additions washed up on the islands. They can be pushed into the water and docked to your ship to be transported around the sea. Seaposts - These have appeared across the Sea of Thieves, offering discounts on a selection of items that change over time. Commendations - Earn 23 standard Commendations during the first two weeks of Forsaken Shores. Additional commendations are coming as part of weeks three and four. All these Commendations are here to stay! Bilge Rat Titles - Earn two unique Titles introduced during the first two weeks of Forsaken Shores. Equip them straight from the Vanity Chest! Will you be a Devil’s Cartographer or Master Devil's Voyager? Additional Titles are coming later in the Forsaken Shorescampaign. Bilge Rat Doubloons - There are 185 Bilge Rat Doubloons available for the Commendations during the first two weeks of Forsaken Shores. Additional Doubloons will be available from week three, alongside the additional Commendations. Each of the Forsaken ShoresCommendations on the Bilge Rat progress screen shows the number of Bilge Rat Doubloons it awards. Time-limited Items - The Forsaken Ashes weapons and ship liveries are available throughout the Forsaken Shores campaign. Visit Duke in any tavern and exchange your Doubloons while they are in stock! Forsaken Ashes Clothing and Items - The Forsaken Ashes clothing and items are now stocked on Morrow's Peak Outpost. Only pirates who have dared to explore The Devil's Roar will be able to purchase these items. These are a permanent addition and can be purchased with gold. 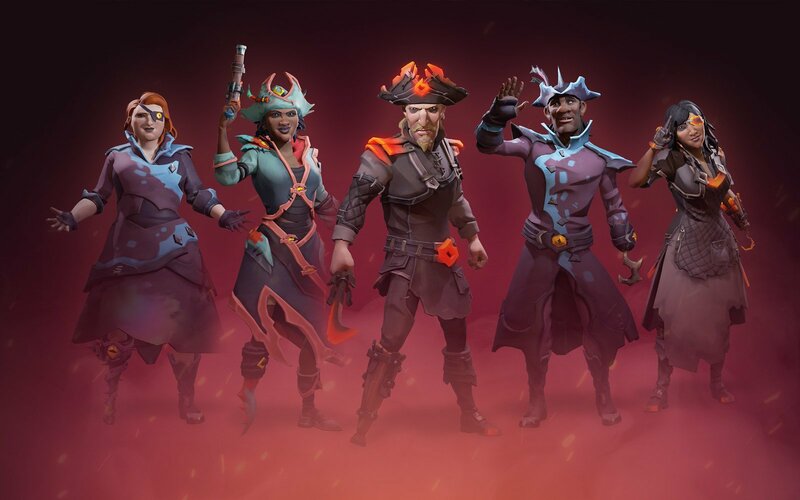 Ocean Crawler Set - The Ocean Crawler clothing, items, weapons and ship liveries are now stocked in their respective shops on Morrow's Peak Outpost. These can also be purchased with gold. Kraken Set - The Kraken clothing, items, weapons and ship liveries are now stocked in their respective shops on Morrow's Peak Outpost. Save some of your hard-earned gold for this impressive new set! Huntress Figurehead - Now stocked by the Shipwright on Morrow's Peak Outpost. This figurehead was exclusively awarded to players around San Diego Comic-Con and Gamescom 2018, but is now available to all pirates in exchange for gold! Barrel Take/Store All - Players can now take and store stacks of resources with a single button press. Barrel Auto-Advance - When removing resources from barrels, if all items in a stack are removed, the next stack with remaining resources with automatically be selected. Resource Capacity - When carrying the maximum number of a specific resource in your inventory, this resource will clearly be marked red in any barrels to indicate that you can't carry any more. UI Close Delay - The short animation of UI closing has been disabled, so players resume control of their pirate immediately. This impacts the closing of all full-screen UI, from shops and barrels to settings and crew menus. Bilge Rat Shop - The Bilge Rat shop now has tabs so that time-limited items appear on a separate page to the Letters of Recommendation and gold bags. Maps in Barrels - Similar to messages in bottles, maps can now be found within barrels. Map Radial - Voyage maps which have been purchased and voted upon will now appear in front of all the emergent message in a bottle/barrel maps, so the most important maps are always easiest to find. Multiple server and client crashes have been resolved. We are constantly reviewing the performance and stability of each patch and providing performance optimisations and stability improvements. "Back" and "Discard" tool-tips are no longer missing from the voyages inventory. Light emitted onto the sea from a lantern no longer causes a 'pixelated' effect. Merchant Alliance crates on board a ship that sinks will not float to the surface and cannot be picked up. We have identified the issue and we are working on a fix. Neat, will fire this up tonight and check it out. Anyone else still playing? I was just thinking I should try this again now, after all this patching and adds.